There are several fundamental factors that help shape the long-term strength or weakness of the major currencies and will affect you as a forex trader. We start easy with the economy and outlook held by consumers, businesses and the governments. It’s easy to understand that when consumers perceive a strong economy. Companies with money spend money. And all this creates some healthy tax revenue for the government. They jump on board and also start spending money. Now everybody is spending, and this tends to have a positive effect on the economy. Weak economies, on the other hand, are usually accompanied by consumers who aren’t spending, businesses who aren’t making any money and aren’t spending, so the government is the only one still spending. But you get the idea. Both positive and negative economic outlooks can have a direct effect on the currency markets. Globalization, technology advances, and the internet have all contributed to the ease of investing your money virtually anywhere in the world, regardless of where you call home. You’re only a few clicks of the mouse away (or a phone call for you folks living in the Jurassic era of the 2000’s) from investing in the New York or London Stock exchange, trading the Nikkei or Hang Seng index, or from opening a forex account to trade U.S. dollars, euros, yen, and even exotic currencies. Capital flows measure the amount of money flowing into and out of a country or economy because of capital investment purchasing and selling. The important thing you want to keep track of is capital flow balance, which can be positive or negative. When a country has a positive capital flow balance, foreign investments coming into the country are greater than investments heading out of the country. A negative capital flow balance is the direct opposite. Investments leaving the country for some foreign destination are greater than investments coming in. With more investment coming into a country, demand increases for that country’s currency as foreign investors have to sell their currency in order to buy the local currency. This demand causes the currency to increase in value. And you guessed it, if supply is high for a currency (or demand is weak), the currency tends to lose value. When foreign investments make an about-face, and domestic investors also wants to switch teams and leave, and then you have an abundance of the local currency as everybody is selling and buying the currency of whatever foreign country or economy they’re investing in. Foreign capital love nothing more than a country with high interest rates and strong economic growth. If a country also has a growing domestic financial market, even better! A booming stock market, high interest rates… What’s not to love?! Foreign investment comes streaming in. And again, as demand for the local currency increases so does its value. We’re living in a global marketplace. Countries sell their own goods to countries that want them (exporting), while at the same time buying goods they want from other countries (importing). Have a look around your house. Most of the stuff (electronics, clothing, doggie toys) lying around are probably made outside of the country you live in. Every time you buy something, you have to give up some of your hard-earned cash. Whoever you buy your widget from has to do the same thing. U.S. importers exchange money with Chinese exporters when they buy goods. 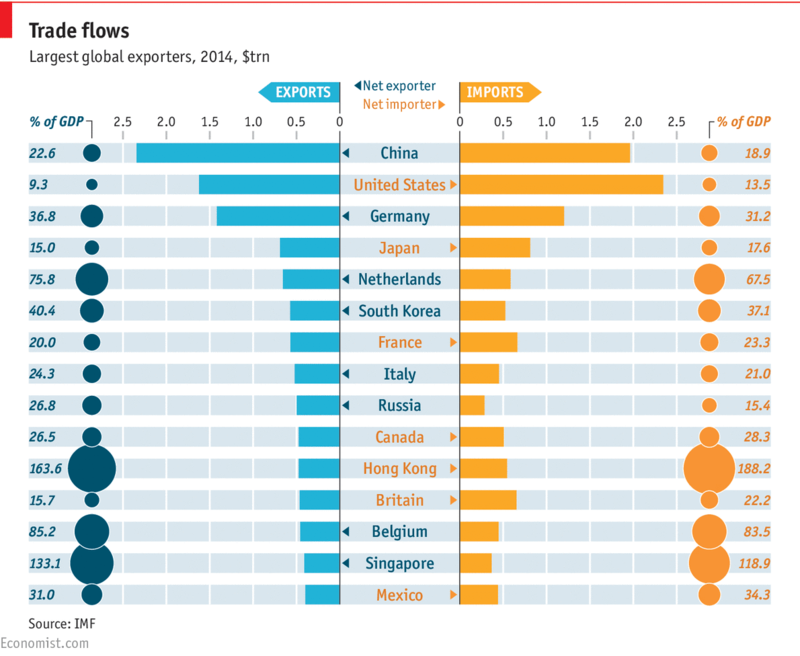 And Chinese imports exchange money with European exporters when they buy goods. All this buying and selling is accompanied by the exchange of money, which in turn changes the flow of currency into and out of a country. Trade balance (or balance of trade or net exports) measures the ratio of exports to imports for a given economy. It demonstrates the demand of that country’s good and services, and ultimately it’s currency as well. If exports are higher than imports, a trade surplus exists and the trade balance is positive. If imports are higher than exports, a trade deficit exists, and the trade balance is negative. Trade deficits have the prospect of pushing a currency price down compared to other currencies. Net importers first have to sell their currency in order to buy the currency of the foreign merchant who’s selling the goods they want. When there’s a trade deficit, the local currency is being sold to buy foreign goods. Because of that, the currency of a country with a trade deficit is less in demand compared to the currency of a country with a trade surplus. Net exporters, countries that export more than they import, see their currency being bought more by countries interested in buying the exported goods. It is in more demand, helping their currency to gain value. It’s all due to the DEMAND for the currency. Currencies in higher demand tend to be valued higher than those in less demand. It’s similar to pop stars. Because she’s more in demand, Taylor Swift gets paid more than Pink. Same thing with Justin Bieber versus Vanilla Ice. The years 2009 and 2010 have definitely been the years where more eyes were glaringly watching their respective country’s governments, wondering about the financial difficulties being faced, and hoping for some sort of fiscal responsibility that would end the woes felt in our wallets. Instability in the current government or changes to the current administration can have a direct bearing on that country’s economy and even neighboring nations. And any impact to an economy will most likely affect exchange rates.